This is a guest post from Florence Broder, Content Manager at AppsFlyer. As users shift from desktop to mobile, advertisers are serving more ads there. Social networks are being used on mobile more frequently and are creating more mobile advertising programs. At the same time there are social networks arriving late to the game. But what does it all mean for advertisers? During every mega sporting event or award ceremony, viewers flock to their social networks to share reactions and comments with their friends. One of the most tweeted sporting events was the World Cup game with over 30 million tweets. It was single handedly responsible for doubling Twitter’s revenue in Q2 of 2014 and most of that came from mobile. If that’s not enough to convince you, on average the most time spent on a mobile device is on social and communication apps. And that’s true no matter what the demographic, as you see from the chart below. 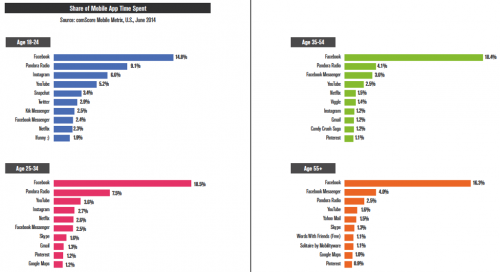 Users want to be connected to their friends all the time no matter how old they are. Given the increased time users are spending on social networks with their mobile device you would think that’s where most advertisers are putting their budgets. However, that’s not the case all. In fact, only 1% of all US advertising spend is on mobile platforms, compared to 43% for TV and 29% for print, according the CMO Council. 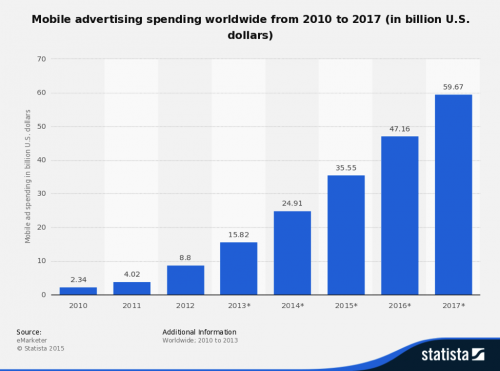 But they too are getting on the bandwagon and will soon be spending nearly $60 billion by 2017 (see chart below from Statista). However, the 2015 Salesforce State of Marketing Report shows that 66% of marketers believe that social is intertwined with their business. It’s safe to assume it’s probably because most users are also accessing social networks on their mobile device. And of course that brings us to the social networks themselves. Facebook and Twitter have been in the lead for a while and even have their own mobile measurement partners, completely embracing the nexus of social and mobile. 2014 saw two major social networks, LinkedIn and SnapChat, debut mobile advertising on their app. Unlike Facebook and Twitter where ads appear in user feeds, both LinkedIn and SnapChat ads appear in a user’s inbox. Pinterest is the latest social network to join the mobile bandwagon, announcing a unique partnership with the Apple App Store, allowing users to download apps directly from a pin. App Pins is the latest in Pinterest’s repertoire of rich pins. Social networks will create more and more opportunities for advertisers to serve ads on mobile. I wouldn’t be surprised to see a promoted pin on my Pinterest board or a sponsored ad in my LinkedIn feed. Social networks will not only respond to this demand but the need for better data and measurement. However, as the opportunities increase so does the competition for a piece of social mobile real estate.